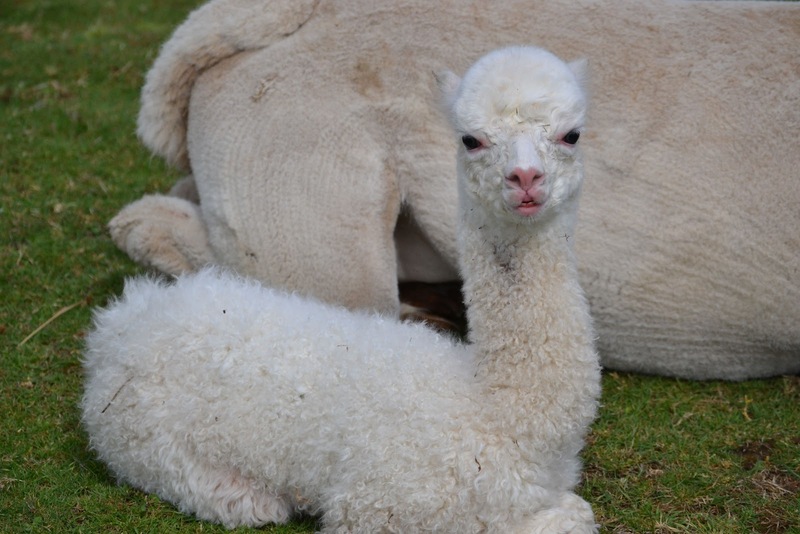 The alpaca breeding business is a true lesson in patience. You carefully research genetics and examine your female and if she has cria, what worked and what could be improved upon and then you make the big decision on which stud to use. After that, it is approximately 11 1/2 months of waiting to see how you did in making your choice. The first eleven months actually seems to fly by but those last couple of weeks and days before that cria is delivered come to a screeching crawl. The anticipation mounts and I look for the most subtle signs that the blessed event is near. 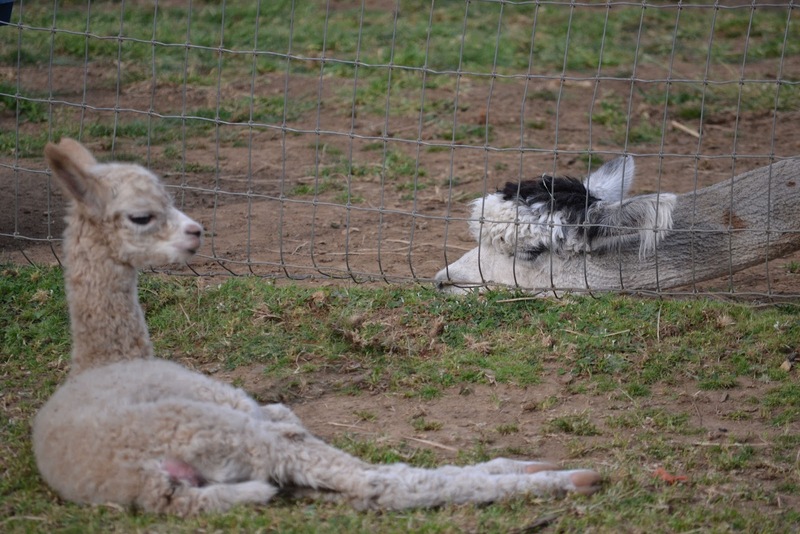 Alpacas tend to deliver their babies before mid-afternoon and usually in the morning so I stay close to home checking every 20 minutes to a half hour to see if anyone is in labor. But, alpacas like to prove that old adage, "Watched pots never boil!" My observations have gotten more vigilant the last two days. Naomi is hanging out by herself more and laying down more too. She is huge so she must be so uncomfortable and tired lugging that big baby around inside her. I was watching her very closely the other day when she was standing at the poop pile for an extra long time. That can be a sign of labor. They feel the cramping and think they need to go potty but in this case, she stood there and nothing came out so that triggered me to observe her more closely for a bit. After nothing happened, she took a few steps and decided she was too tired to head back to the herd so cushed right where she was. She looked miserable. I have a tree stump in the pasture and decided to sit down on it and offer her a little energy session. Naomi is one of my new members to my herd. She is still rather skittish and wary of me so I didn't want to touch her so I can intuitively "send" the energy to her. I sat and watched her for a bit and she would shift her body to one hip and then back into a sternal position. I could tell by watching her which areas of her body seemed to be most uncomfortable by how she laid on the ground. I could also tell by her eyes that she just wasn't feeling great. I focused my attention and took slow breaths to help me concentrate and let my regularly rambling brain quiet down. I visualized nice quiet white light drifting over her and wanted it to feel gentle and soothing. I kept picturing the energy enter into her body and helping her to relax. I do my energy much like a guided meditation talking to the animal in my mind about the light and oxygen entering her body to move through her body to all those areas that need comfort. I sent her this gentle energy for about 5 minutes when I saw her eyes get heavy and she laid her head down on the ground and fell sound asleep. I was pleased that it gave her some comfort to get some rest but it also pleased me that she accepted the energy. She has been so very wary of me so to let me sit as close as I was to her and to take in the energy being offered was a sign that she is starting to build some trust in me. Back to my hot tea, my binoculars and get further tested in patience. Perhaps that should be one of the babies' names - Patience! 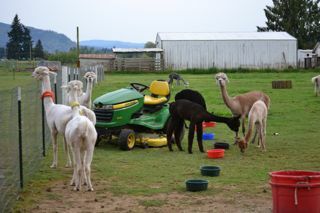 Shearing day is quickly approaching. 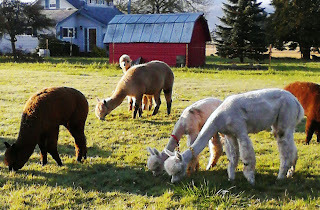 The annual alpaca fiber harvest. 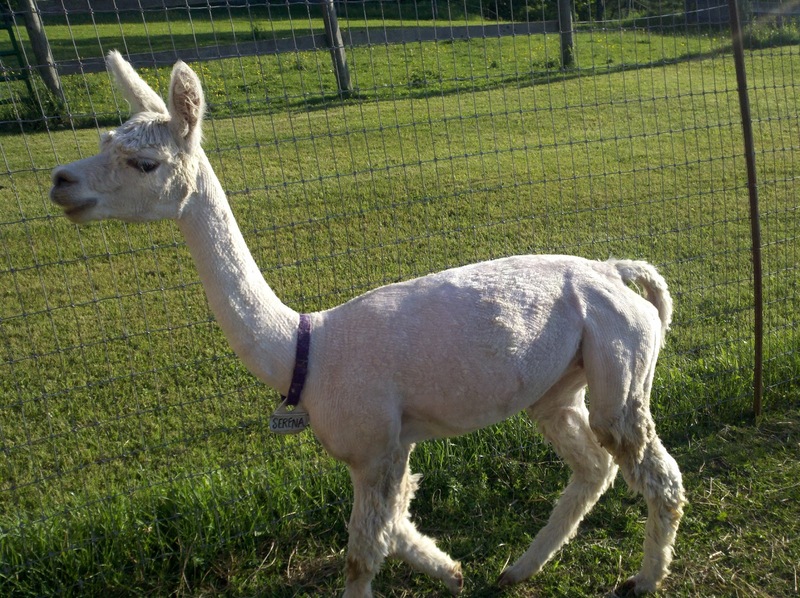 This will be the most animals sheared on the farm this year. Thirty-two animals needing shearing so a long day ahead. Volunteers are coming and makes the work go so smoothly and fun. There will be a holding area where animals will be prepped and weighed, then come over for shearing where toenails are trimmed, teeth trimmed if necessary and booster shots given. 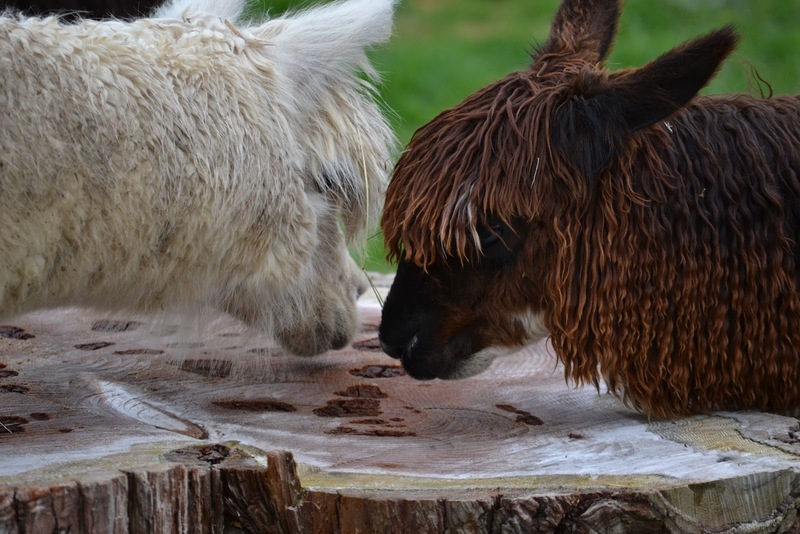 It's a full spa day for alpacas. I'm not known for being the most organized person around but on this day, I make an extra effort to be organized so it goes more smoothly. 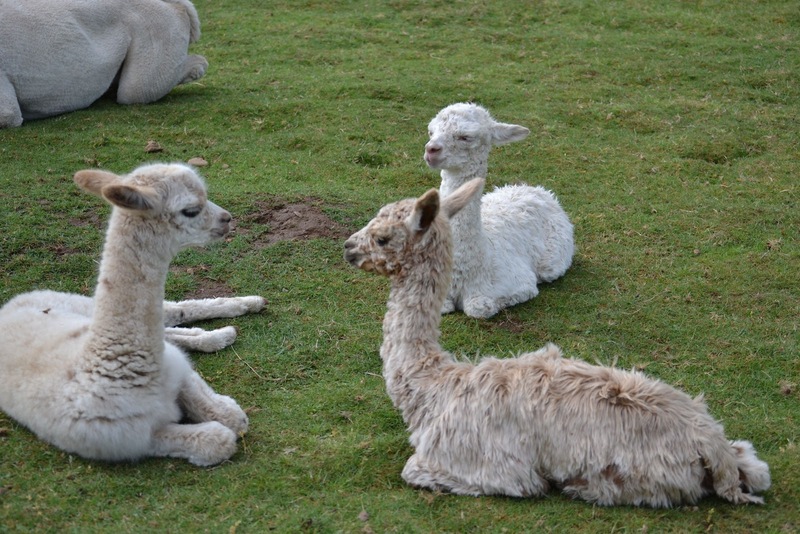 This year could be even more interesting with cria due any time. But with so many volunteers coming, there will be plenty to help no matter what added events happen. 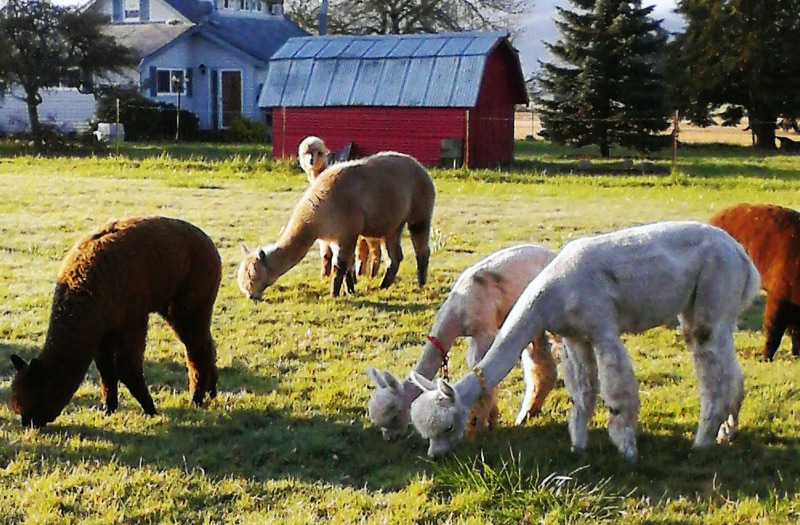 The biggest concern for me is knowing how stressed my animals are during shearing. The ones that have been through it before, still are not happy about it. I was so pleased last year that they all handled it pretty well though. There was only had one spitter! I have some new animals since then and they haven't full adjusted yet to the ways of Hum Sweet Hum. I use Rescue Remedy for stressed animals (and me) and this year I'm also going to try using calming essential oils. I used Rescue Remedy on animals at a recent show I attended. I experimented with them sniffing it instead of putting it in their mouths. 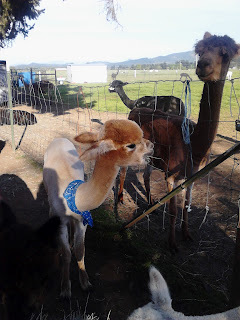 We were about to enter in the ring and the alpacas started to act up. I didn't want to amp them up more by opening their mouths and putting Rescue Remedy drops in their mouth. It seemed counter-productive. So I opened the bottle and held it up so they could sniff. It was almost immediate that they calmed down. The scent is very strong and they would shake their heads at the strong odor but then came back and take another whiff. It was totally on their terms if they wanted to take a whiff of it or not. When they seemed to have enough, I put the stopper back on and observed them. 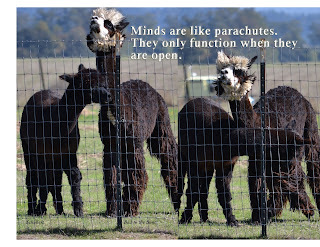 The alpaca's energy calmed down a couple of notches. They were still alert and not happy about being in these foreign surroundings of the show ring but calm enough to be handled more easily and they showed beautifully too. After my experience at the alpaca show, I decided to learn a bit more about Essential Oils and so this year at shearing, we will be trying a couple of different oils to see if they help calm these critters down before they get sheared. I'm most interested in my very pregnant females. It's always a dilemma on whether to shear or wait. Temperatures are beginning to rise and full fleeced females that are near term can be stressed more than the stress of a quick shearing. The daily heat is an extended and long term physiological stress whereas the shearing is a short term fear based stress. I know how gentle my shearer is and how fast he is so this year we will proceed with shearing them all. So this year, I'm opting to shear all my pregnant females and hope I can keep them calm with my essential oils and Rescue Remedy to keep them from going into premature labor. Shearing day is a lot of details for me to keep straight. With three females near term, I will be on hyper-vigilance for babies so think I will be giving a whiff of essential oils to the animals and one for me! Or maybe two or three for me!!!! 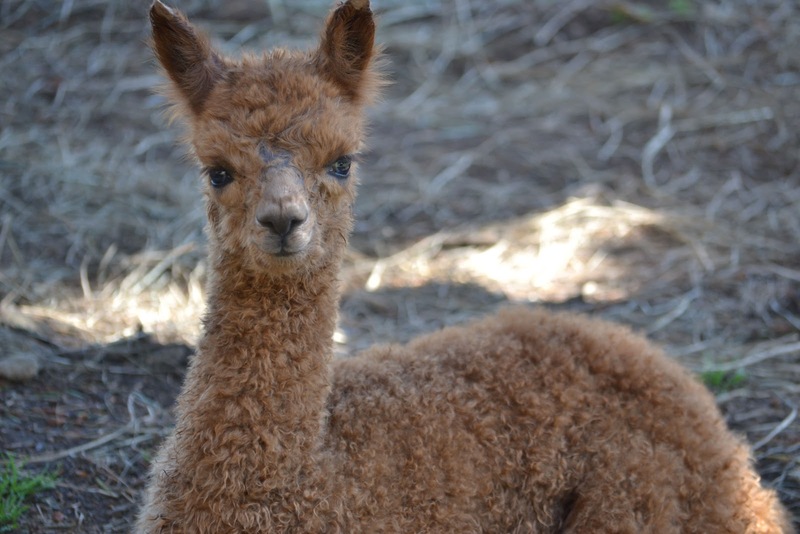 If anyone out there has had experience with Essential Oils on their alpacas and other animals, I'd be interested in hearing what you think has worked or hasn't worked. Watched pots never boil. Alpaca gestation is about 11 1/2 months. It's a long wait and amazingly, the first 11 months go by really pretty fast but the last couple of weeks before they are due comes to a standstill. I like to start keeping closer tabs about 2 weeks before their estimated due dates. 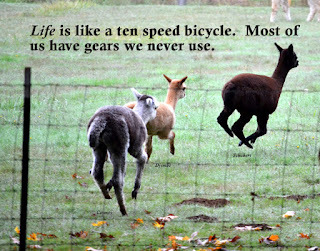 Alpaca instinct is to keep it pretty stoic about any weakness. It is imperative to their survival in the wild not to show it. They would be first one to be taken by prey if they are seen as weaker. So seeing signs of labor can be very subtle. They can even put labor on hold if they feel they are being threatened. So I try and watch from afar if I think one is in labor. I pull out my binoculars and watch at a distance or I grab a rake and start raking poop. They are used to seeing me do that on a daily basis so they tend to not be bothered if I'm raking. I rake with the binoculars around my neck taking peeks regularly. There are times when those gals run late. They must not look at the calendar because I know when I breed them and can do a pretty good estimate but they ignore that and have it when they are darn well ready to have that baby. I had one that was 364 days into her gestation. I had second guessed myself into believing she had slipped the pregnancy. I walked my pastures looking for a stillborn. I drove myself nutty watching her and seeing any unusual movement as either she was in labor or I used it to convince myself she wasn't pregnant. Then I would see the baby move and I would take a deep breath and make myself go back to other projects. I was ready to name the baby Timex because it just was on its own time about being birthed. But when the time was right, a healthy baby was born with no issues or assistance required. Birthing is both exciting and high order anxiety. Until all is well and baby nursing nicely, I am on full alert mode. It's been six months since the last birth here so it's time to dust off the neonatal kit and check that all is in order in my box and all my supplies and gear are in place and within easy reach. I'm starting to watch the mom's tummies to see if babies are kicking and moving. So fun to watch a leg kick or roll. The babies start to drop and get into position. A sign we are getting closer. Then waiting to hear the dam humming. Sometimes they start to hum a day or two before birth. They talk to their babies so the babies know mom's voice. That is a good sign to step up the watchfulness if I hear an expectant mom humming. If I can get into position, I try and sneak a peek at the dam's udders to see if milk is coming in but some of my Huacaya's have so much fleece, it's impossible to see under there. I have notes with the list of possible names written down and add to it. Some names come so easily and others take time and research to get the one that fits them just right. I try and follow a musical theme to fit with my Hum Sweet Hum farm name but sometimes a baby just wants to be named something else. It never gets boring being an alpaca breeder. New babies on the way, pastures going to be filled with new life and lots of cria races. I love it! 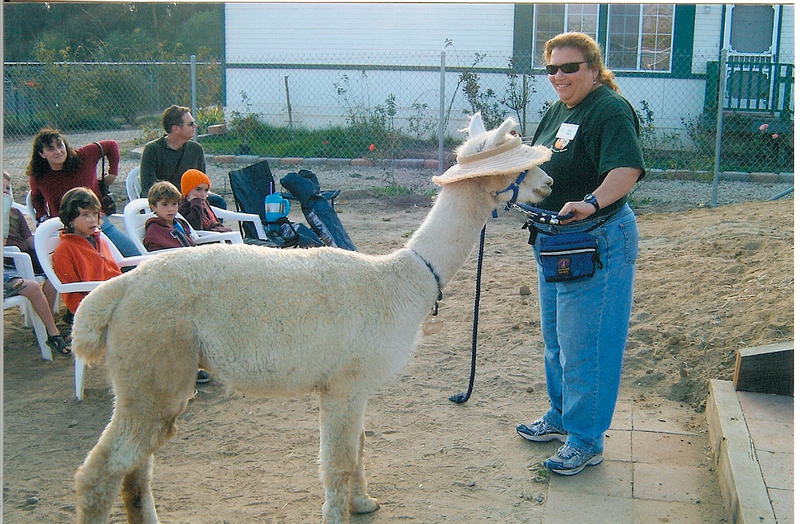 When I began clicker training and doing Energy Work on alpacas I was presented a challenge of working with Serena. 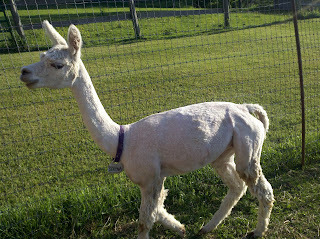 She was one of the most skittish alpacas at the farm when I was still boarding. I had just gotten my first alpacas a few months earlier and had been experimenting with the clicker on my animals and had been having good success. One day I came to work with my girl and I heard this horrible scream coming from the barn area. It was ear piercing and could be heard from the far reaches of the 25 acre ranch. I ran to see if help was needed but got there to find all the humans acting quite normally. It sure didn't match the fearful screams coming from the alpaca. I was told Serena always behaved that way the second she was caught or even looked at. Talking more to her owner I saw a glint in her eye as an idea took hold. She looked at me and offered me a challenge. If I wanted to prove my clicker training was worthwhile then I should see if it would work on Serena. If I could get Serena to take treats and do some of the stuff I had been doing with my animals, then I would really know that it worked and she said she would be really impressed. 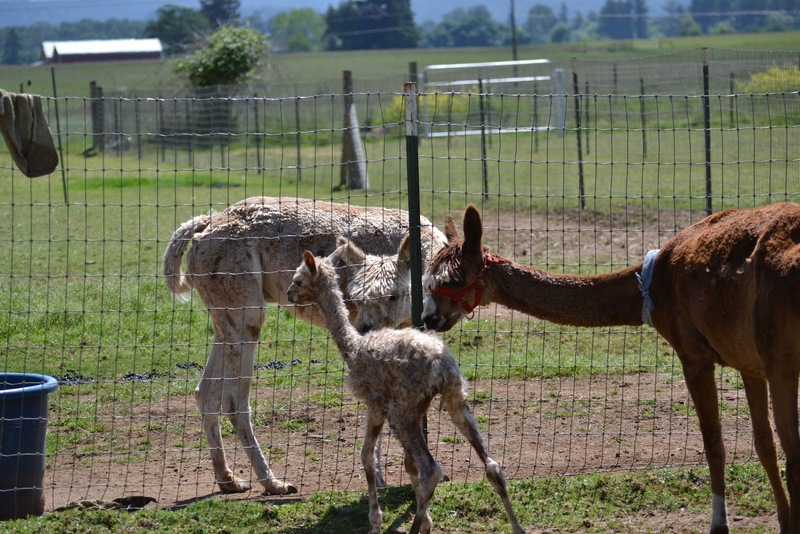 I said I would take on her challenge if she would keep Serena and her cria in a pen up by the barn for two weeks. She readily agreed. I waited a little while for Serena to calm down and went in to the pen to assess her reaction to me. I didn't expect much especially after just being handled and going through the stress of her pregnancy test. I was going up against a lot. She was just confirmed pregnant which is when they are so hormonal and spitty to all. 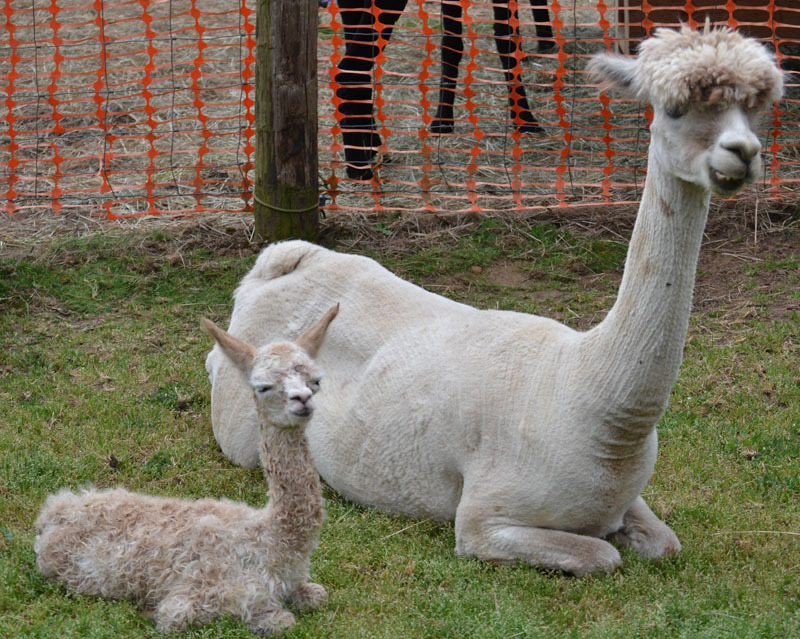 She was extremely frightened of humans at the best of times and she had a young male cria at her side she would want to protect. The odds of me being successful were slim. 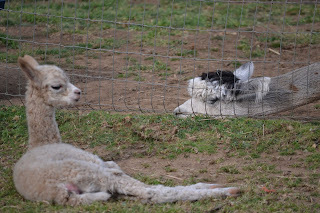 She of course kept her distance from me but her cria was fairly calm and liked pellets and he came over to accept. I thought perhaps he was my way "in" with Serena. I went out every day for two weeks. The first few days were not real successful. Serena kept her distance but I got in some nice training with her boy. He was a good candidate for the clicker so I worked with him all the while she observed me warily. I had a thought of trying some Reiki on her. I came in one day and sat down after working with her boy. I just sat right down in the dirt with my back against the fence for my comfort and got as far away from Serena as I could in the pen. I can "send" energy so used that distance technique. I was amazed that after about 10 minutes, I watched Serena's eyes get heavy. She did a few head bobs fighting off the sleep and then finally gave into it. She cushed and dozed off with me in the pen with her! I was thrilled. It showed me she could calm down and that she was accepting the energy. The next day I came back and tried again and she cushed quicker and fell sound asleep. What was really astonishing was the fact that the vet was there again and there was so much commotion going on all around us and lots of stressed animals. She would normally be on high alert wondering if she would be the next one to be caught but there she was sound asleep. The owner passed by one time and did such a double take as she saw me sitting on the ground and seeing Serena sound asleep with me only a few feet away. I saw her shaking her head as she walked into the barn. The chances of me winning the bet and challenge were showing promise. It came down to the last day of my two weeks with Serena and she was coming so close to eating from my hand. She would eat pellets out of a trough with me sitting there and my hand near but she would only take it from the trough and not my hand. After trying various things, I finally got her to take the pellets if I sprinkled them right next to my hand. She had to touch my hand to get the pellets. It took her a few tries and to get her courage up but she finally did it. I let her do that a few times to get more trust in me and then upped the ante to putting the pellets in my hand. She did it! She took pellets from my hand. It took all I had not to do a loud whoop! But I didn't want to scare her so I kept my mouth shut. She took more treats from me when I stood up and when I called the owner over, she got to witness me giving Serena pellets from my hand. Unfortunately, once Serena got put back into the big pasture with the others, she wasn't about to come near me again. I was a bit sad about that but that was all I was asked to do and I moved on to other training and working on other methods. But, every time I saw Serena in a pasture, I would say hello and offer her pellets. She always turned me down. Two years passed and the most I did with Serena since our time up by the barn was to say hello when I saw her and offer her pellets that were never taken. She never came closer than 10 feet near me and if I moved anywhere near her, she bolted. So one day when I was walking down the path to do some work with my animals, I was caught by surprise when offering treats at random this white suri named Serena took treats from me. I did a double take to make sure I was seeing right. Yes, it was indeed Serena. I offered her another handful and she took it again. I found out later she was pregnant so that her being receptive to suddenly accepting treats wasn't because I timed it right to when she wasn't pregnant. She had just decided that after two years, it was safe to accept and she was ready. It was those 1000 times I said hello but never asked more from her and respecting her wishes for distance. It was on her terms. After that day, I went into the pasture and offered her pellets and got her to even give me kisses! She now has a new owner that adores her and lives in a beautiful setting in Vermont where she gets tons of treats, carrots and apples. Visitors mean more treats for her. This once very shy animal that screamed if you looked at her now comes and gets her goodies, doesn't scream even during shearing! It only took 1000 hellos.